Many carpets become loose over time. It is possible to re-stretch them so they are tight again. Re-stretching a carpet is a sign that it is winding down in its life expectancy, but it can buy you a little time before you do a full replacement. It usually takes several hours to stretch a room. The furniture must be moved and the carpet needs to be re-cut on walls, doorways, in floor outlets, etc. It takes a skilled person to do this kind of work. Sometimes re-stretching will not be possible because of the condition of the backing. 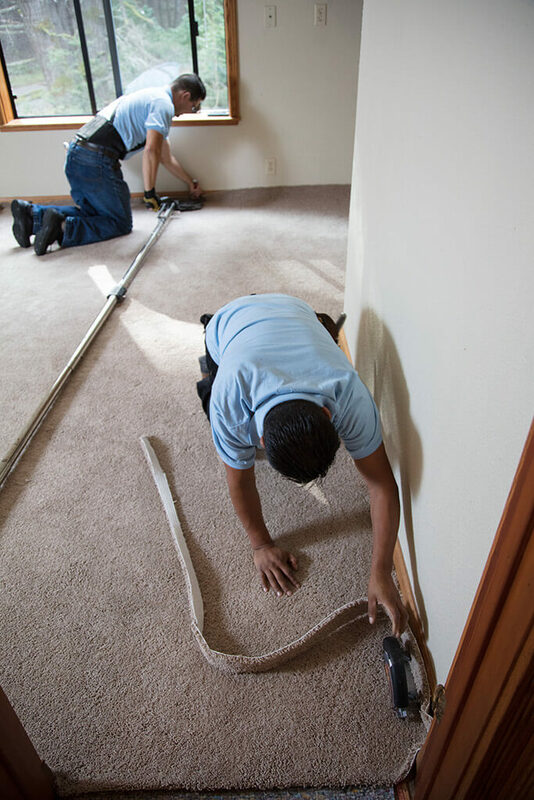 If the carpet is loose because the backing is deteriorated, the carpet will not hold a stretch, and a new carpet is going to be prescribed. All floors, no matter how durable can sustain damage from many sources, such as pets, heavy appliance or furniture drag marks, and water leaks. Sometimes carpets and wood floors can be patched and repaired. Our expert technicians can evaluate the extent of the damage to your floor and let you know the best course of action. Repairs are not always possible, although we will always do our best to find the most cost effective and suitable solution for the area of concern. Easy planning process, a quality job completed on time and without complications.